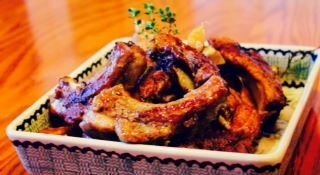 Savory ribs: non-barbecue style. Yes, there is really such a thing! These ribs are very different then the sticky sweet or dry spice rub ribs that most think of when you say, “let’s have spare ribs”. But let me tell you, once you try these, you are hooked! And they are so easy. A salty brine 2 to 24 hours in the refrigerator. For this method, remove from fridge and drain off brine at least 1 hour before cooking. Pat dry and sprinkle with freshly ground pepper. Or rain on the salt and allow to marinate at room temperature (a cool kitchen of course) for up to two hours, but at least an hour. Heat a large skillet over med high heat. Once heated add 2 tablespoon olive oil; the oil should shimmer but not smoke. 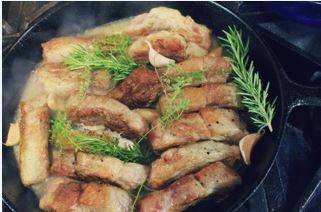 Carefully place ribs in a single layer in frying pan uncrowded and not touching. You can do these in batches! Brown on all sides, turning as needed, then remove to a plate. Once all the ribs have been browned, reduce the heat to medium. Return all the ribs back to the pan in as much as a single layer as possible. Now it is OK if they touch! It may even be necessary to stand some up on their sides. 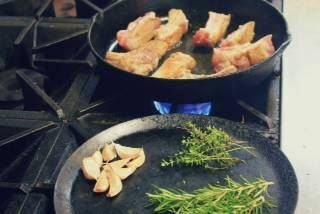 Pour any accumulated meat juices into the skillet along with the garlic, herbs, wine and broth. Increase the heat to bring the liquid to a boil, then reduce heat to low and cover with a lid. Cook for 1 1/4 – 1 1/2 hours, turning and repositioning ribs about every 20 minutes. 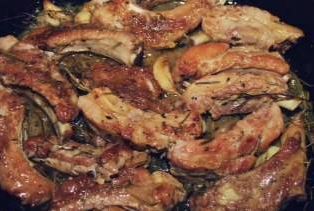 Ribs will continue to brown slightly becoming fork tender, and the liquid will become thick and rich. Watch for over-cooking which results in a broken sauce, i.e. separation of the fat from the sauce. Also meat should not be at boil but rather a low simmer/braise. Smash the garlic, which is now soft and sweet, and stir around in the sauce. Stir the ribs to coat with the garlicky wine sauce. Serve warm. Bon Appetite!